Treasury Bills (or T-Bills for short) are a short-term financial instrumentMarketable SecuritiesMarketable securities are unrestricted short-term financial instruments that are issued either for equity securities or for debt securities of a publicly listed company. The issuing company creates these instruments for the express purpose of raising funds to further finance business activities and expansion. that is issued by the US Treasury with maturity periods ranging from a few days to 52 weeks. They are considered the safest investments since they are backed up by the full faith of the Treasury Department of the United States Government. When an investor buys a Treasury Bill, they are essentially lending money to the government. The US Government uses the money to fund its debt and pay ongoing expensesFixed and Variable CostsFixed and variable costs are important in management accounting and financial analysis. Fixed costs do not change with increases/decreases in units of production volume, while variable costs are solely dependent on the volume of units of production. This guide teaches an analyst the fixed vs variable cost methods such as salaries and military equipment. T-Bills are sold in denominations of $1,000 up to a maximum of $5 million. Treasury bills are sold at a discount to the par valuePar ValuePar Value is the nominal or face value of a bond, or stock, or coupon as indicated on a bond or stock certificate. It is a static value determined at the time of issuance and unlike market value, it doesn’t fluctuate on a regular basis., which is its actual value. For example, a Treasury bill with a par value of $10,000 may be sold for $9,500. 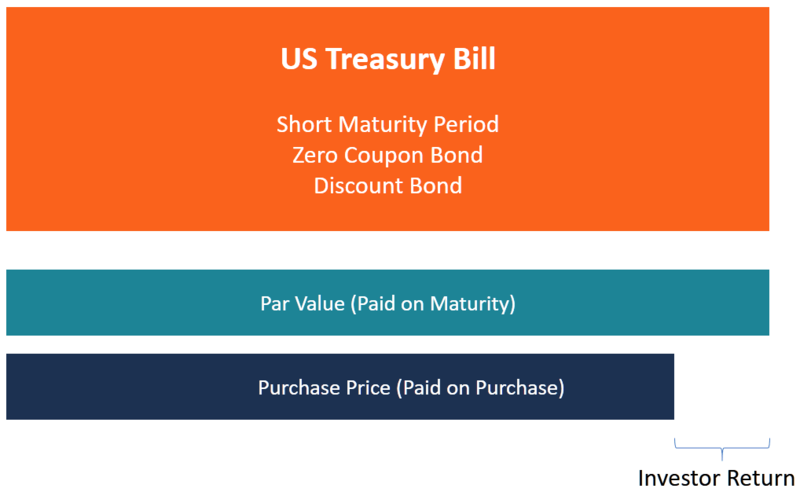 The US Government, through the Department of Treasury, promises to pay the investor the full price of the T-bill after a specified maturity date. After the expiry of the maturity date, the government will pay back $10,000, resulting in a profit of $500. The amount of profit earned from the payment is considered the interest from the investment. The difference between the face value of the T-bill and the amount that an investor pays is called the discount rate, which is calculated as a percentage. In this case, the discount rate is 5% of the face value that equals $500. In a non-competitive bid, the investor agrees to accept the discount rate determined at auction. The yield that an investor receives is equal to the average auction price from the bidders. Individual investors prefer this method since they are guaranteed to receive the full amount of the bill at the expiry of the maturity period. Payment is made through TreasuryDirect, bank or broker. In a competitive bidding auction, the investor buys the T-bills at a specific discount rate that they are willing to accept. There are three possible outcomes in a competitive bidding auction. First, the bid is accepted if the discount rate that an investor wants is less than the discount rate determined by auction. Second, the bid is accepted if the discount rate that an investor wants is equal to the discount rate determined by auction. Lastly, the bid is rejected if the discount rate specified is higher than the discount rate determined by auction. Payments must be made either through a bank or a broker. Investors can buy or sell treasury bills on the secondary marketSecondary MarketThe secondary market is where investors buy and sell securities from other investors (think of stock exchanges). For example, if you go to buy Apple stock, you would purchase the stock through a trading exchange, from investors who already own the stock, rather than Apple. Apple would not be involved in the transaction. Also, there are mutual fundsMutual FundsA mutual fund is a pool of money collected from many investors for the purpose of investing in stocks, bonds, or other securities. Mutual funds are owned by a group of investors and managed by professionals. Learn about the various types of fund, how they work, and benefits and tradeoffs of investing in them and Exchange-Traded Funds (ETFs)Exchange Traded Fund (ETF)An Exchange Traded Fund (ETF) is a popular investment vehicle where portfolios can be more flexible and diversified across a broad range of all the available asset classes. Learn about various types of ETFs by reading this guide. that sell previously issued T-bills. The Federal Reserve is responsible for setting the monetary policy in the United States, and this is likely to affect the T-bill price. The T-bill interest rates tend to move closer to the interest rate set by the Fed every time a change occurs in the market interest rate. However, a rise in the federal funds rate tends to attract investments from other debt securities, resulting in a drop in the T-bill interest rate. The decline continues until the T-bill interest rate rises above the federal funds rate. The maturity period of a T-bill affects its price. For example, a one-year T-bill comes with a higher rate of return than a three-month T-bill. The explanation for this is that the delayed use and added risks are reflected in the returns of a longer T-bill. For example, a $1,000 T-bill may be sold for $970 for a three-month T-bill, $950 for a six-month T-bill and $900 for a twelve-month T-bill. The means that a shorter T-bill will be more expensive than a longer T-bill. An investor’s risk tolerance levels also affect the price of a T-bill. When the U.S. economy is going through an expansion, and other debt securities offer a high return and are less risky, T-bills are usually less attractive to buy and, therefore, low-priced. However, where the markets are turbulent, and other debt securities are riskier to invest in, T-bills become a haven since they are backed by credit from the U.S. Department of Treasury. The demand for T-bills increases and so does the price. Although T-bills are considered safer debt securities, their prices are affected by the prevailing rate of inflation. For example, if the inflation rate stands at 5% and the T-bill discount rate is 3%, it becomes uneconomical to invest in T-bills since it will result in a loss. The effect of this is that there will be less demand for T-bills and their prices will drop. Treasury bills have a maturity of one year or less, and they do not pay interest before the expiry of the maturity period. They are sold in auctions at a discount from the par value of the bill to create an interest to investors. They are sold with maturities of 28 days (one month), 91 days (3 months), 182 days (6 months) and 364 days (one year). Treasury notes have a maturity period of two to ten years. They have denominations of $1,000 and have coupon payments every six months. The 10-year T-note is mostly quoted by economists when assessing the performance of the bond market. It is also used to show the future market’s take on macroeconomic expectations. Treasury bonds have the longest maturity among the three treasuries. They have a maturity period of between 20 years and 30 years, and coupon payments every six months. T-bond offerings were suspended for four years between February 2002 and February 2006, when it resumed due to demand from pension funds and other long-term institutional investors.